Saudi Arabia is building great wall — or rather, a great chainlink fence with razor wire — to "protect against ISIS" in Iraq. And it's not the only country investing in very expensive walls right now, even though they probably won't work. Why? Because walls aren't just about security. They're also powerful symbols. News outlets like NPR and UPI have been reporting the project for weeks, but so far we have very few pictures of the actual wall itself. According to the Telegraph, Saudi Arabia wants to "insulate itself from the chaos engulfing its neighbors," and it's doing so with a supremely high-tech wall. Two high fences, 300 feet apart; 40 watch towers; 900 miles of fiber optic cable; underground movement detection. Saudi Arabia's government has been talking about this wall for a loooong time—since 2006—but in early January, ISIS attacked a border post and killed four guards, making it very clear that Saudi Arabia is a big target, and raising the question of the wall once more. But will a glorified fence really keep out a nebulous group like ISIS? And is that really all this wall is designed to do? It's a contentious question, and it's complicated by the fact that Saudi Arabia isn't the only world power throwing up walls along its borders. There are dozens of security walls going up around the world, as Reece Jones, the author of Border Walls: Security and the War on Terror in the United States, India, and Israel, told me over email. The International Organization of Migration reports that 40,000 have people have died in the past decade alone trying to cross borders. "The construction of border walls and the violence of borders is a significant development globally over the past twenty years and one that is not well documented," says Jones. Why are so many countries returning to the oldest defense mechanism known to civilization, one that is far from effective? The answer is more complicated than security alone. Let's back up for a second. Why did humans even start building walls? As Gizmodo's Annalee Newitz pointed out last year, it wasn't for defense at all: They were social. As humans domesticated and began to settle in communities and even small villages, walls became a way to foster privacy and even prevent groups of humans from "fragmentation into hunter-gatherer groups." In hot, dry climates, there were environmental benefits too—thick, high walls kept cool air in and created shade. Jeddah under attack in 1517. Wikimedia Commons. But like so many other countries, walls became a crucial because they are the primary defense against seemingly endless invasions in Saudi Arabia. In a way, you could see the centuries of turmoil that rocked it as a long succession of building, destroying, and rebuilding walls: From the strong, thick walls built hastily around Jeddah in the 16th century to keep the Portuguese out, to the old capital—a walled city called Diriyah, which is now just a lovely, UNESCO-protected ruin—that was destroyed by the Ottoman Empire of the early 1800s after a six month siege. Saad ibn Saud palace in Diriyah by Fedor Selivanov. In a way, Saudi Arabia walling off its borders just seems like a continuation of a centuries of history. If Walls Don't Work, Why Are We Building So Many of Them? Let's be real, though: The Ottoman Empire invading in 1818 was probably the last time a wall served as an effective defense, too. We live in an age of mortar shells and heat-seeking missiles and cyber warfare. But here's the funny part: Even though walls aren't as infallible as they were two centuries ago, they're absolutely exploding across the world. Besides obvious examples like Israel's "separation barrier" in the West Bank and the United States' own farcical partial wall at the Mexico border, there are dozens of other countries building walls around themselves right now. There's the 1,050-mile-long fence between Turkmenistan and Uzbekistan, There's the 700-mile trench being dug between Afghanistan and Pakistan. There's the wall that Greece put up along its border with Turkey. North Korea and South Korea, too. An excavator digs a trench along the Pakistan Afghanistan border. AP Photo/Matiuallah Achakzai. Walls are springing up across our world with incredible speed, which contradicts many cliches about globalization. Sure, the world is getting smaller; it's also getting more carefully delineated and guarded. The French historian Jacques de Saint Victor came up with very snazzy term for this phenomenon in an essay called The Return of Walls: A Closed Globalization?. He describes it as the "neo-feudalization of the world." Even though it's draped in technology and futurism, the construction of carefully controlled walls is all about imposing order on the chaos of poverty-stricken, war-torn groups of people. A Southern Arizona rancher stands at the border wall with Mexico in 2010. AP Photo/Matt York. "These walls are usually built along borders where there is a sharp wealth discontinuity across the border with a wealthy state directly beside a poor state," Jones told me over email, adding that Saudi Arabia and Iraq have "one of the widest wealth differences in the world," with GNI per capita at $53,640 and $14,930, respectively. The same goes for the US-Mexico border, and the South Korea-North Korea border, too. "Typically the country building the wall describes the threat on the other side as an uncivilized and violent people living in an ungoverned space," he writes. Ethiopian migrants gather as they wait to be evacuated on the border with Saudi Arabia and Yemen, Wednesday, March 21, 2012. AP Photo/Hani Mohammed. The violent threat against Saudi Arabia is clear, but there are socioeconomic issues at play with these walls, too. Saudi Arabia, one of the richest countries in the world, is bordered to the south by the poorest and most resource-scarce country in the region, Yemen, which has also become hotbed of terrorism. To the north, there's a war-torn and poverty-stricken country controlled by ISIL, one of whose stated goals is to take control of Mecca and Medina in Saudi Arabia. Faced with encroaching chaos on either end, a great wall—no matter how totally futile—starts to make more sense. Walls are just as important as symbols as they are as defenses. The security expert Bruce Schneier has described this effect when talking about TSA screenings at American airports as "security theater:" A feature that enhances a sense of security without security itself. Walls aren't really about defenses, they're about optics—demonstrating a controlled divide for the people on either side. "Once the wall has been erected, it acquires a life of its own and structures people's lives according to its own rules," Costica Bradatan said in the New York Times. "It gives them meaning and a new sense of direction. All those walled off now have a purpose: to find themselves, by whatever means it takes, on the other side of the wall." So maybe Saudi Arabia will actually built this 600-mile wall it's been talking about for a almost a decade. Maybe it won't. It doesn't really matter, because we're already talking about it exerting control over the chaos surrounding it. The wall its neighbors and the rest of the world is imagining—the one drawn in the neat, isometric illustrations—seems like it's almost as important than the real thing. 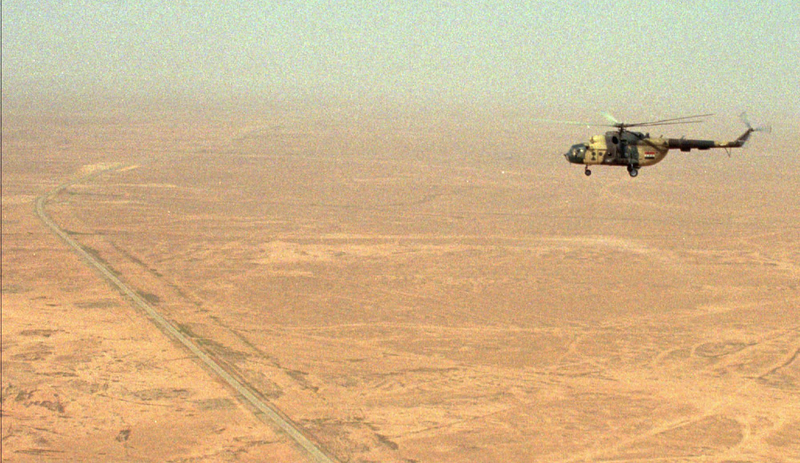 Lead image: An Iraqi helicopter flies over the Iraqi desert near the Iraqi-Saudi Arabia in 1997. AP.